Two matchups are left in each conference to determine the two finalists going to the NBA Finals. Both teams have proven they can win at home and on the road. 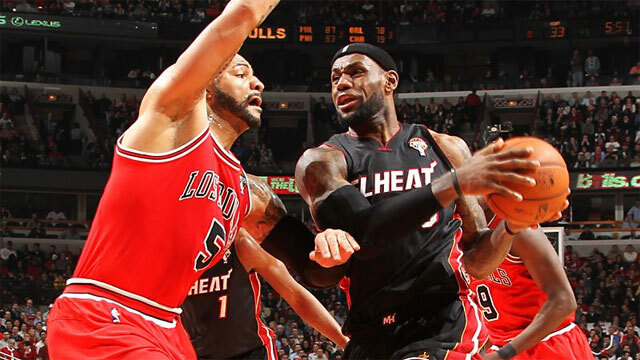 But what a shocker it was when the Bulls stunned the Heat Monday night on the road. While we still don’t have news on whether Derrick Rose will play, the Bulls might have some other issues they might want to deal with. Sixth man Nate Robinson carried the Bulls to the second round despite being ill and throwing up courtside. Luol Deng has also been dealing with the flu and a spinal tap and missed the last two games in the series against the Brooklyn Nets. Veteran guard Kirk Hinrich is also dealing with a calf injury, and if he returns, he won’t be at 100 percent. The Bulls surprised many in knocking out the Nets on the road in seven games with their stingy, tough defense. The defending champions swept the Milwaukee Bucks in Round 1 and have been off for 10 days. This will help them in the long run. The Heat have no serious injuries as Dwayne Wade has gotten better during this break and will be cleared to play come game time. The Heat didn’t have a hard time moving past the Bucks, winning by an average of 14 points. The Heat is arguably toe-to-toe with the Bulls defensively, both coaches stress sharing the ball and defensive pressure on the ball. With a solid supporting cast in Chris “The Bird-Man” Anderson, Ray Allen, Shane Battier, Mike Miller and Norris Cole, this Heat bench can bring it when their starters are resting. And LeBron James just won his fourth MVP in the last five years. They were simply stunned by the intensity the Bulls brought to Miami in game 1. But the defending champions know how to bounce back. Just count on Lebron James. Chicago might steal a game or two, but when the dust settles Miami continues its quest for two in a row. Remember the “choke artist” in Reggie Miller scoring eight points in 8.9 seconds and later staring down at Spike Lee while using one hand to choke himself and the other holding down on his crotch? 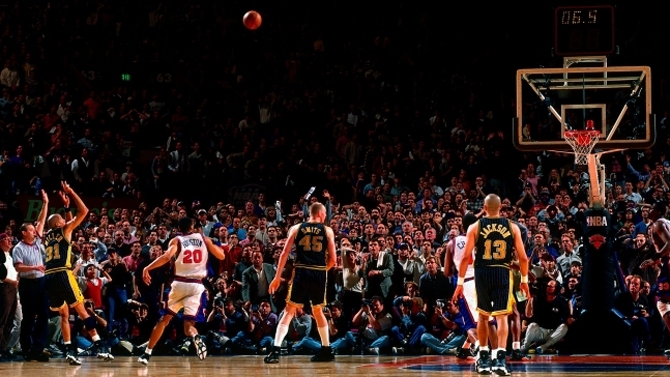 Yeah those were the great days of the Knicks/Pacers Series, and now it is finally BACK! The Pacers did what neither team could do during the regular season, win on the road. After stealing game one, this Pacers team now really has the edge to move on to the Eastern Conference finals with its undefeated home playoff streak. The Pacers had their moments in round one against the Atlanta Hawks but they overcame it in game six to eliminate the Hawks. The Pacers led the league with 45.9 rebounds per game and they showed it in their first round match-up, dominating the boards and points in the paint which has caused a HUGE problem for the Knicks. In game one the Pacers won the rebounding edge 44-30 and points in the paint 46-32. The Pacers will have to continue to play this type of ball in hopes of knocking off the Knicks and moving on to possibly face the defending champion Miami Heat. 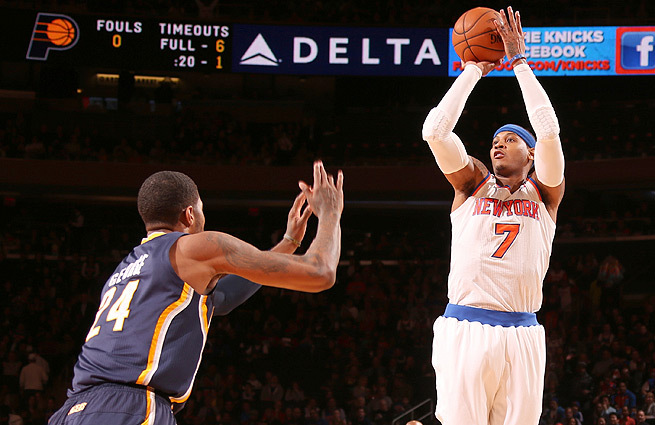 Home court is what they need to focus on, now having only three home games left, the Knicks need to secure all 3 games at home and steal one at Indiana where the Pacers are 30-11 and currently undefeated in the playoffs. The Knicks will hope to get a low-post boost in Amare Stoudemire possibly returning in game three and hopefully Marcus Camby can be more productive as they will be outsized against David West, Roy Hibbert and Paul George. Quote from Charles Barkley on TNT, “You don’t live by the threes, you die by it.” The Knicks have been this way all season, they average over 24 attempts but in game one the Pacers beat them in that category and if they want to have any chance of making this a series, they have to make it rain. New York didn’t come this far without some success and recognition. We’ll hope for a great seven-game series but when it’s all said and done Reggie Miller will be smiling after game seven. So the names for this year’s dunk contest came out last week and it’s safe to say that no one’s jaw dropped. In fact, more people probably were wondering whether these guys were even in the NBA. We’ll do a quick run-through of this year’s featured players. Representing the Western Conference we have Jeremy Evans, Eric Bledsoe and Kenneth Faried. In case you missed last year’s dunk contest, Jeremy Evans won by jumping over a chair and dunking two balls at once, followed by dunking over Kevin Hart. Yes, the year after Blake Griffin won the dunk contest by jumping over a car, Evans won by jumping over a 5-foot-2 comedian. Speaking of Kevin Hart, we have a player who could stand in for him if need be. (I’m just kidding, Eric Bledsoe is 6 foot 1 and one of the best trade assets in the NBA). Bledsoe, or the slightly smaller Nate Robinson, has some major hops but being only 6 foot 1 it’s hard to do a lot with the ball while in the air. If anything though his dunk should get a good score just for the time he dunked and made Mark Cuban’s face look like this. Last but not least for the West, we have the Manimal. Kenneth Faried is an absolute beast and he’s very capable awing a crowd. He’s by far the most explosive in this competition and bright spot in this contest. It’s good to see they made sure at least one NBA starter was on here with a name already known throughout the league. For the Eastern Conference the dunkers are Gerald Green, Terrence Ross and James White. You might have heard the name Green and wondered why it was familiar. It’s because six years ago Green won the dunk contest when he was on the Boston Celtics. Since leaving the Celtics that year, Green has been on five different NBA teams and it’s questionable what the journeyman has left in the tank. Green does have an advantage over his fellow journeyman White. Green may not have the best resume, but at least he never fell out of the league. White started for San Antonio in 2006, then moved to Houston and then was out of the league following the 08-09 season until this year when he joined the Knicks. His career minute average is 8.6 minutes per game. He’s probably spent more time in dunk contests than actually on the NBA court. It can’t be denied that the guy can dunk though and he could be one of the best dunkers in the contest since Blake Griffin. White’s the heavy favorite and for good reason. Terrence Ross is the lone rookie in the dunk contest and the second favorite behind White. The young Raptors guard has a future in the league and perhaps he can get his name known early by pulling off the win. So just to be clear, we have last year’s contest winner, a taller Nate Robinson, one NBA starter, two players who have not stayed on the same NBA team for more than a year and a rookie making up the dunk contest. I’m not saying it will be terrible, but the lineup is not exactly marquee. This got us here at theCover4 thinking about whom the best possible dunk contest would feature. Representing the Western Conference: Russell Westbrook, Kevin Durant and Blake Griffin. Russell Westbrook is an absolute athletic freak, just look at him simply dominate 7-footer Omer Asik. If Westbrook could do this in a game, imagine what he could do during the competition. I don’t care if Westbrook and Durant are on the same team; I want to see Durant in the dunk contest. The flying stick has some mad hops and has seemed to start enjoying posterizing people more recently. Just watch his new KD 5 commercial and how he’s shed his Mr. NBA Nice Guy image. Anytime you can get a near 7- footer get his head above the rim regularly, I want him in the contest. Blake Griffin should automatically have a spot reserved in the contest annually. I can’t imagine someone I’d rather not be than Mozgov at this moment. Nothing says posterized quite like getting your face shoved into a NBA player’s crotch while getting dunked on simultaneously. Until someone humiliates a player more than this, Blake has an automatic dunk contest berth. Representing the Eastern Conference, we would have LeBron James, Paul George and Derrick Rose. The Twitter world collectively held its breath when James tweeted “Dunk Contest?” on February 7. Everyone has wanted to see what LeBron could do during the competition but he has repeatedly refused to participate. If the Akron Hammer decides to throw down this year, it will definitely be a dunk contest that’s remembered for years. I know that everyone is going to say Paul George was in the dunk contest last year and failed to win. The guy has talent and his explosiveness can’t be denied. Last year’s glow-in-the-dark jersey was so-so but he’s got the talent to compete with anyone in the league. The Derrick Rose inclusion is hoping that Rose comes back as his old self from his knee injury. The former MVP has nearly unrivaled explosiveness, with Westbrook probably being the only guard capable of matching his athleticism and speed. If he’s back to his old self, he’s one of the most entertaining point guards in the league. While we’ll probably never have a dunk contest featuring this caliber of players, we can always dream. Here’s to hoping that this year’s young dunk contest participants can put on a show and make their names well known by NBA fans. The dunk contest has long been one of the highlights of All-Star weekend and while it’s not what it could be, it offers an opportunity for these young players. White could be one of the best dunkers in the NBA and I fully expect him to put on a show. I fully expect him to win the competition and have his name known throughout the league Saturday night.